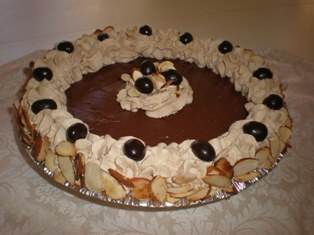 This is our collection of Italian dessert recipes for everyday, holidays, seasons of the year, and special occasions. 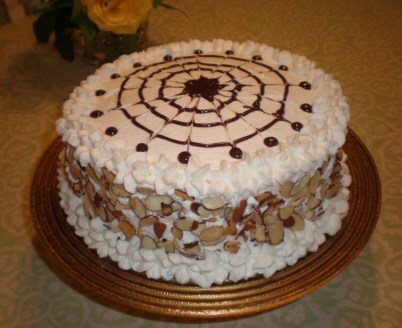 It contains traditional and non-traditional (cucina nuova) Italian desserts for simple family gatherings or for entertaining. PLAN AHEAD Butter, eggs, and liquids should be at room temperature to combine evenly. Butter can be microwaved in short increments at 50% power to speed up the process and whole eggs can be placed in warm water. DON'T RUSH when mixing the butter and sugar. 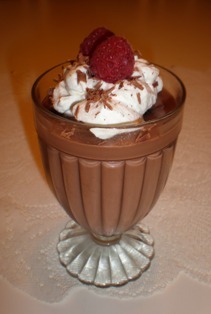 This step, called creaming, aerates the batter for a light and fluffy texture. CHECK THE INGREDIENTS specified in the recipe. Even when not stated, most baking recipes require that unsalted butter and large eggs be used. MEASURE flour in a dry measuring cup, leveling it off with aknife. Measure liquids in a liquid measuring cup, checking for accuracy at eye level. 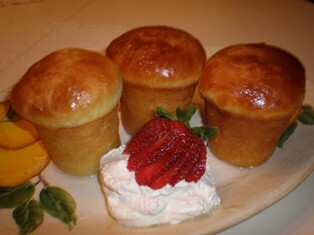 ALTERNATE dry and wet ingredients when beating them into the batter. This helps to prevent toughness. Always begin and end with the dry ingredients. 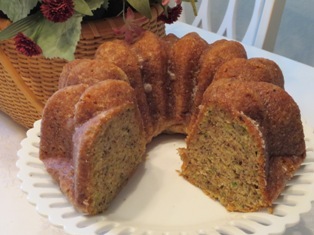 CAKE BATTER can't be made in advance but unfrosted cakes can ... and they also may be frozen. 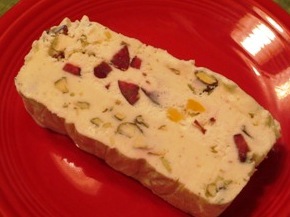 Cool completely and wrap in plastic wrap before refrigerating for 2 days or freezing for a month. Thaw completely before icing or decorating. If you never had the room in your kitchen for a full-size KitchenAid mixer, maybe now you do. Geared toward consumers with “limited counter space and ‘smaller batch’ lifestyles,” the new 3.5-quart capacity Artisan Mini model is 20 percent smaller and 25 percent lighter than the classic Artisan (or about 19 pounds, compared to 26). All of the attachments that fit into the classic stand mixers also fit into the smaller version. And perhaps most importantly, the motor that runs the Artisan Mini runs with the same power as the Classic Series stand mixer. 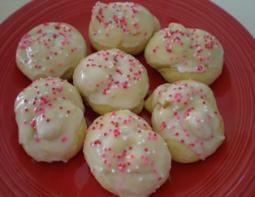 Knot Cookies are traditional Italian cookies that are usually made for special occasions, especially weddings. 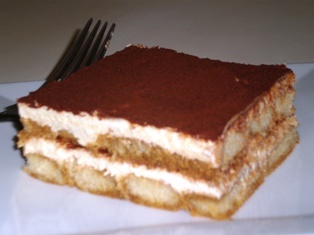 Tiramisu is an Italian dessert made with mascarpone cheese, delicate ladyfingers, and laced with strong espresso coffee and Marsala wine. In this recipe the apples are folded into the cheesecake mixture, poured over a graham cracker crust, and topped with a crunchy crumb topping. 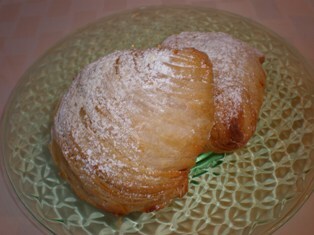 Sfogliatelle means many leaves or layers and this crisp pastry's texture resembles leaves stacked on each other. 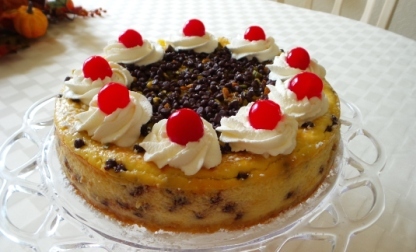 Sicilian cassata is a traditional dessert made with ricotta cheese, candied citrus peel, and homemade sponge cake (pan di spagna). 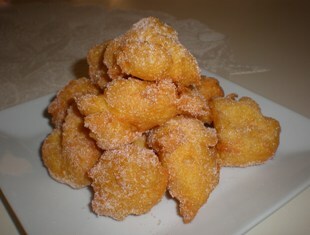 Zeppole are a fried Italian pastry that are served warm and dusted with confectioners' sugar or cinnamon-sugar. 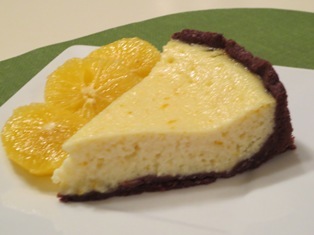 This tart has a ricotta cheese filling that is light in texture with a subtle citrus orange flavor on top of a crunchy chocolate and cinnamon pastry crust. 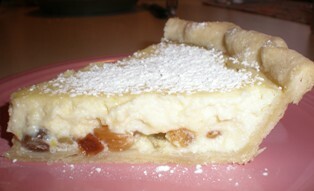 Pizza di Crema is a Neapolitan custard pie flavored with orange zest, cinnamon, and vanilla and enhanced with cherries. These ices are a mixture of water, sugar and a flavoring. They are grainy in texture and are frozen in a pan in the freezer. 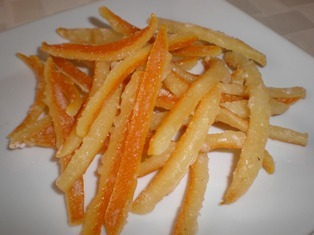 Candied orange peel is the skin or peel of an orange that has been "preserved' in a sugar syrup. 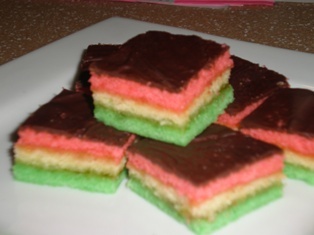 These festively colored cookies are made with 3 layers of cake with a rich almond flavor, separated by sweet apricot jam, and topped with chocolate icing. 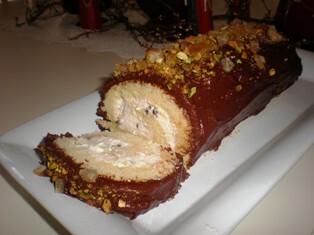 This recipe takes the delicious flavor and creamy texture of cannoli filling and turns it into a wonderful party snack. 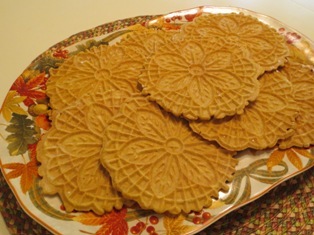 A traditional Italian pizzelle recipe with the added flavors of pumpkin and spices. 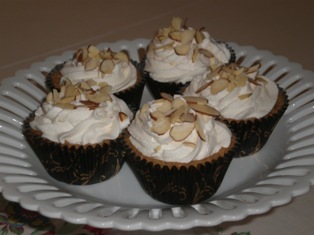 served on birthdays or other special occasions. 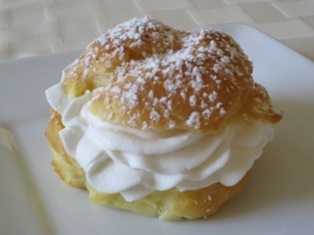 In Italian, cream puffs are called "Bocconcini con Crema" or little mouthfuls of pastry with cream. The names and shapes of these fried delicacies differ from region to region. A crisp, buttery tart shell filled with lemon-flavored custard and topped with slices of fresh seasonal fruit. 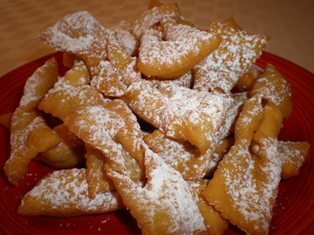 The babas are made with a sweetened yeast dough and are soaked with Limoncello syrup after baking. 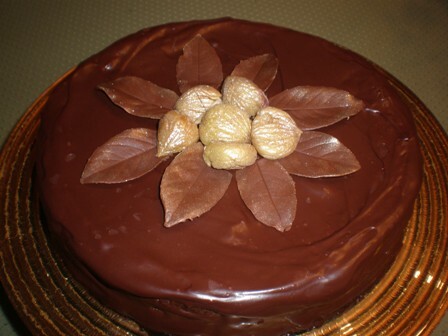 This is a very rich and decadent chocolate cake that requires no baking. 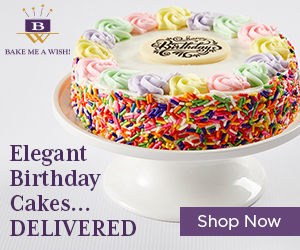 The creamy chocolate mousse filling sits on a crunchy chocolate cookie crumb crust and is topped with sweetened whipped cream. 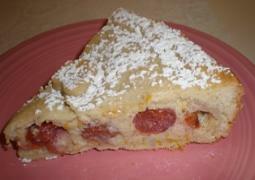 A sweet and creamy custard pie with wheat berrie and candied citrus inside a lattice-topped pastry crust. 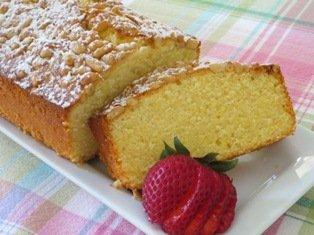 Polenta pound cake is a simple cake that packed with the flavors of lemon, vanilla, and almond. 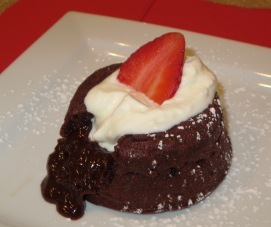 A silky chocolate pudding filling topped with espresso flavored whipped cream. 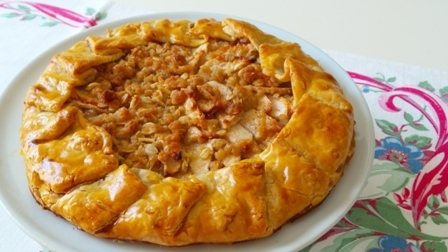 Apple Crostata is a very rustic-style apple pie with some added crunch. 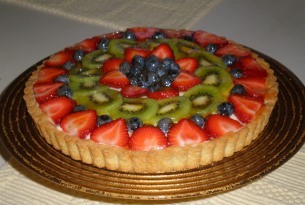 This recipe is easily adapted to create other types of fruit crostatas; try sliced pears, peaches, or berries. These miniature apple strudels are the perfet size for a quick snack, to add to a dessert buffet, or to end an elegant meal. 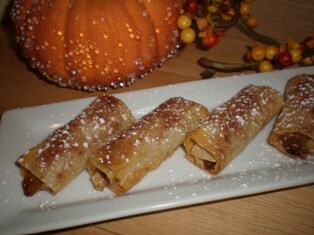 The strudels are made with phyllo dough and filled with apples raisins,and walnuts. 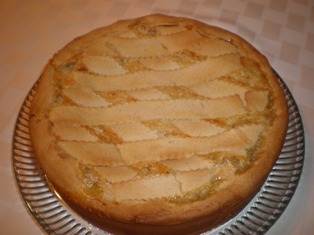 Fiadone or ricotta pie is a typical Italian dessert is often served as an Easter specialty in southern Italy. 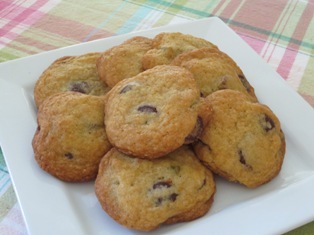 A different chocolate chip cookie recipe with the added flavors of orange and pistachio. 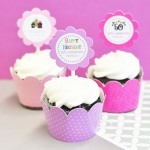 Each ingredient has it's own distinctive taste that blends to create a truly delicious cookie. 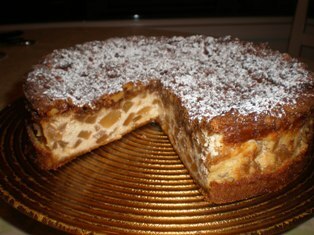 A delicious and unique cheesecake that combines apple cider-flavored risotto with a luscious cream cheese filling and is topped with fresh brown sugar and cinnamon apple slices. The Chef’s Choice Toscano pizzelle maker will cook two beautiful traditional size homemade pizzelles in less than 30 seconds. In this recipe, traditional Italian holiday bread, panettone, is baked with a creamy pumpkin and spice-flavored custard. 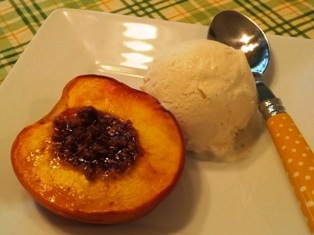 Servings are then topped with a rich crème anglaise sauce and a dollop of bourbon-flavored whipped cream. 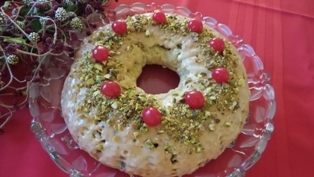 Ciambellone (some call it ciambella) is a ring-shaped dessert that is a cross between a bread and a cake and if often served for Easter. 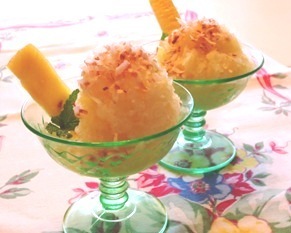 Most ciambellone have a distinct flavor that comes from the zest of lemons. 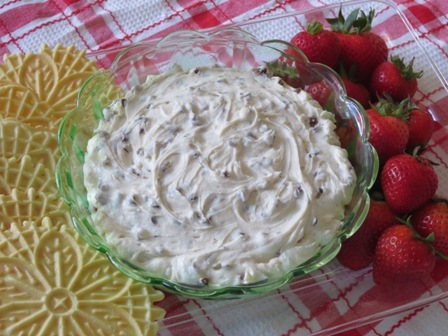 This recipe also has the addition of ricotta cheese.